ATLANTA (November 27, 2018) – The Chick-fil-A® Foundation is honored to announce the recipients of Chick-fil-A’s 2019 True Inspiration Awards. The 22 deserving not-for-profits, located in 18 states throughout the country, are receiving a combined $1.23 million in grants to further their work in fostering leadership, education and an entrepreneurial spirit in children living in their local communities. Now in its fifth year, the True Inspiration Awards were created to carry on Chick-fil-A Founder S. Truett Cathy’s legacy of generosity, community service and dedication to inspiring children to become future leaders. The grants range from $20,000 to $100,000. 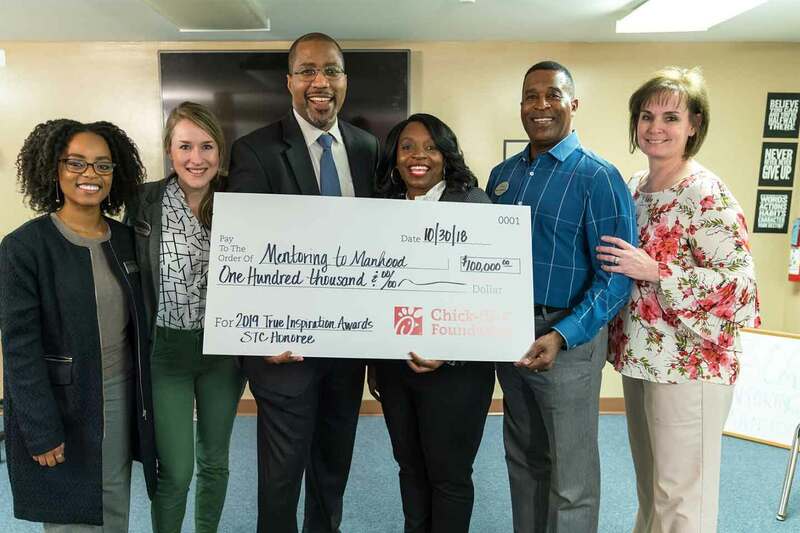 The recipients either applied for an award directly or received a nomination from a local Chick-fil-A restaurant franchisee based on the group’s work in their local community. Mentoring to Manhood, a youth mentorship-focused organization located in Prince George’s County, Maryland, has been named this year’s S. Truett Cathy Honoree. Each year, the S. Truett Cathy Honoree is awarded a $100,000 grant for being recognized as an organization that embodies the innovative and entrepreneurial spirit of Chick-fil-A’s late founder. Founded by four men who wanted to make a difference in the lives of young African-American boys in their community, Mentoring to Manhood provides weekly tutoring, group mentoring and family support to more than 150 middle and high-school aged boys. The awards are given based on the following categories: Emerging Leader Development, Innovative Education, Youth Entrepreneurship, S. Truett Cathy Honoree and regional winners. The Innovative Education category awards organizations that focus on improving teaching and learning through ground-breaking practices and visionary leadership; the Youth Entrepreneurship grants are given to organizations that develop business knowledge, entrepreneurial skills and financial literacy to those in need; and the Emerging Leader Development category awards organizations that focus on character development, positive community and cultural involvement and effective civic engagement. The True Inspiration Awards are one way the Chick-fil-A Foundation is fulfilling its mission to help every child become all they can be. The 22 organizations will be honored by the Chick-fil-A Foundation at the fifth annual True Inspiration Awards celebration in Atlanta this spring. Chick-fil-A reported more than $9 billion in revenue in 2017, which marks 50 consecutive years of sales growth. A leader in customer service satisfaction, consumers voted Chick-fil-A, Inc. #4 in Harris Poll’s annual corporate reputation survey, ranking the company 4th out of 100 in 2018. Chick-fil-A was also recognized for customer experience again in the 2018 Temkin Experience Ratings survey, was named “Best Franchise Brand” in 2018 by Airport Revenue News and was named one of the top 100 best places to work by Glassdoor in 2017. Continuing its founder’s legacy of generosity and service, in 2018 Chick-fil-A’s Remarkable Futures initiative awarded $14.65 million in scholarships to restaurant Team Members nationwide. More information on Chick-fil-A is available at www.chick-fil-a.com. Each year, the Chick-fil-A Foundation honors and celebrates 22 outstanding community organizations across the country through the True Inspiration Awards. These organizations are working hard to inspire and motivate our future leaders and make a lasting difference in their communities.